FullStory uses machine learning to highlight the most frustrated sessions contained in your account and grade the customer experience data you're collecting. We then benchmark your grade against other companies similar to you in size and industry and let you see how you rank in comparison. What is a Rage Grade? Rage Grade is a letter grade that is calculated from frustration events that we identify in your session data. Your grade is based on your account's percentile rank against your peers. Note: Admins can change company type and size under Settings > Profile to ensure best results. You can also opt-out of this feature if you don’t want to be benchmarked. Where can I find my Rage Grade? Rage Grade will be available for the standard segments that FullStory provides. Scroll below the user list to view Rage Grade alongside all of the other Searchies. The grade will be based on the default time range for the standard segments. When you are outside of the standard date range or if you are in any other search or segment, you'll see a Top Frustrated Sessions searchie instead of a Rage Grade. How are you scoring frustration? We calculate a smart frustration score, using a combination of frustrating events that are found in the segment. This score is normalized by the total number of sessions in that segment, so you're being graded on the rate of frustration for the segment. To eliminate false positives, we ensure there is a high enough threshold of combined events before counting them against your score. In other words, you won't get a bad grade just because you have a lot of "rage" clicks on a calendar widget, which might be an intended behavior. How can I improve my Rage Grade? Within the Rage Grade Searchie, we will surface sessions where we found the most frustrating events. When clicking into these sessions, we'll highlight the events on the right that contributed to the frustration metric. Watching these sessions should point out broken, buggy, or otherwise unfriendly UX within your app. Once you've identified and fixed those issues, you should start to notice your score improving! Your grade is recalculated every 6 hours and is based on data from the default time range for standard segments (see above table). Why do my frustrated sessions show only mouse thrash events? Typically when you have a lot of thrashing in your frustrated sessions, you'll notice you have a pretty good grade (B+ or better). This is because our algorithm first looks for brokenness and then for other events like thrashing and abandonment. Why do I see an A grade in the "Rage clicked recently" segment? An A grade does not mean you do not have any rage clicks, but it does mean that you have a lower rate of overall frustrating events within your rage click sessions, as compared to others in your industry. Is a poor Rage Grade always indicative of a bad UI? Because Rage Grade is calculated as a benchmark instead of a straightforward score, it’s possible for a segment to contain mostly great customer experiences but still receive a low grade. In a curved grading system, someone always has to have an A, and someone always has to be at the other end of the spectrum. So don’t despair if you have a bad grade in a highly competitive industry, it could just mean that every company in your category is doing a really spiffy job! Why do I have to wait for my grade after changing my industry? 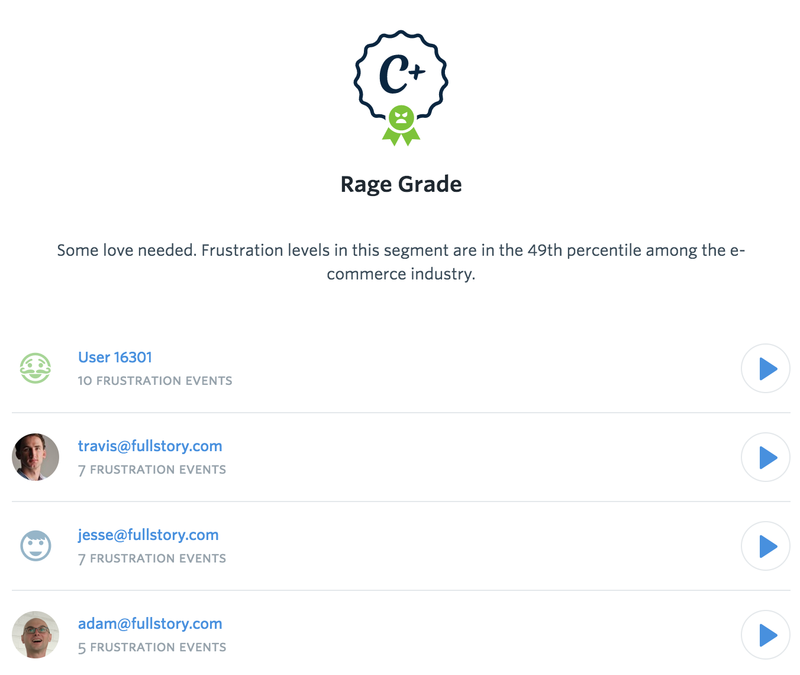 Because rage grade is a benchmark, we compute the frustration score and the corresponding rank for all companies in your industry every 6 hours. Your grade in the new industry will only be available after the next grading cycle. What if I have false positives in my Rage Grade? We are constantly tweaking our algorithm to improve results and remove false positives. Even so, there may be an abandoned form on your site or an intended quick click interaction that continues to show as frustration. You can use `fs-ignore-form-abandon` or `fs-ignore-rage-click` to ignore these elements and remove them from your calculation.